After the House, with the support of fifty-five Democrats including Nancy Pelosi and Debbie Wasserman Schultz, blocked attempts to reform the FISA Act, Rand Paul and Ron Wyden attempted to filibuster FISA renewal in the Senate. They wrote this letter describing the civil liberties violations in the bill to renew and expand the FISA act for six years. The vote was close, with sixty votes required for the cloture vote. Cloture passed on a vote of 60 to 38, with Democrat Claire McCaskill casting the deciding vote. Once again several Democrats voted to betray the Constitution and vote against civil liberties. Eighteen Democratic Senators, along with independent Angus King of Maine, vote for cloture. The Democrats voting for cloture were: Tom Carper (Del. ), Bob Casey (Pa.), Catherine Cortez Masto (Nev.), Joe Donnelly (Ind. ), Tammy Duckworth (Ill.), Dianne Feinstein (Calif.), Maggie Hassan (N.H.), Heidi Heitkamp (D-N.D.), Doug Jones (Ala.), Amy Klobuchar (Minn.), Joe Manchin (W.V. ), Claire McCaskill (Mo. ), Bill Nelson (Fla.), Gary Peters (Mich.), Jack Reed (R.I.), Jeanne Shaheen (N.H.), Mark Warner (Va.), Sheldon Whitehouse (R.I.). The following Republican Senators voted to support the filibuster, which would have provided an opportunity to debate and offer amendments to reform the law: Rand Paul, Ted Cruz, Mike Lee, Steve Daines, Cory Gardner, Dean Heller, Jerry Moran, and Lisa Murkowski. Yes, Ted Cruz was on the right side of this while eighteen Democrats were not. The final bill is expected to pass the Senate this week. This bill doesn’t just renew Section 702 for six years; it also codifies permission for the FBI to access and use data secretly collected from Americans for a host of domestic federal crimes that have nothing to do with protecting America from foreign threats. It has added some unusually worded warrant requirements that will protect some people—but only when they’re actually suspected and are being investigated for criminal activities. 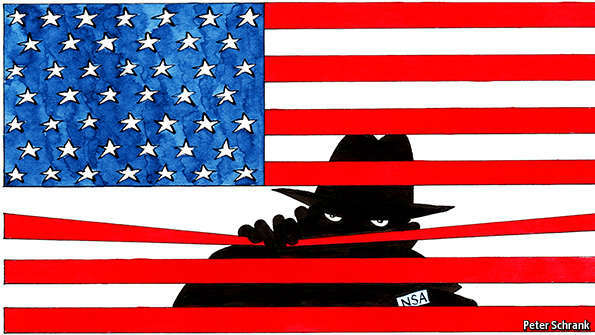 Furthermore the bill will give the NSA permission to attempt to restart what are known as “about” searches, access to communications that merely reference a foreign target, not just communications to and from that target. The NSA voluntarily ended these types of searches once it became clear they were gaining access communications that they had no authority to be viewing. This bill will allow them to attempt to restart it unless Congress acts separately to stop it. Once again many Democrats have acted as collaborators rather than as the resistance. Democrats who claim that Trump is a tyrant in cahoots with Putin have not been able to unite to oppose giving him increased powers to spy on Americans. Although they are a minority in both Houses of Congress, the presence of some Republicans supporting privacy rights, along with the requirement for sixty votes in the Senate, provided Democrats with the power to force changes. A swing of one vote in the Senate or twenty-six Democrats in the House could have forced reforms to the law which allows warrantless surveillance of Americans as well as foreigners. A story that had circulated during the campaign without much effect resurfaced: it involved the charge that Russian operatives had hacked into the servers of the Democratic National Committee, revealing embarrassing emails that damaged Clinton’s chances. With stunning speed, a new centrist-liberal orthodoxy came into being, enveloping the major media and the bipartisan Washington establishment. This secular religion has attracted hordes of converts in the first year of the Trump presidency. In its capacity to exclude dissent, it is like no other formation of mass opinion in my adult life, though it recalls a few dim childhood memories of anti-communist hysteria during the early 1950s. The centrepiece of the faith, based on the hacking charge, is the belief that Vladimir Putin orchestrated an attack on American democracy by ordering his minions to interfere in the election on behalf of Trump. The story became gospel with breathtaking suddenness and completeness. Doubters are perceived as heretics and as apologists for Trump and Putin, the evil twins and co-conspirators behind this attack on American democracy. Responsibility for the absence of debate lies in large part with the major media outlets. Their uncritical embrace and endless repetition of the Russian hack story have made it seem a fait accompli in the public mind. It is hard to estimate popular belief in this new orthodoxy, but it does not seem to be merely a creed of Washington insiders. If you question the received narrative in casual conversations, you run the risk of provoking blank stares or overt hostility – even from old friends. This has all been baffling and troubling to me; there have been moments when pop-culture fantasies (body snatchers, Kool-Aid) have come to mind. Like any orthodoxy worth its salt, the religion of the Russian hack depends not on evidence but on ex cathedra pronouncements on the part of authoritative institutions and their overlords. Its scriptural foundation is a confused and largely fact-free ‘assessment’ produced last January by a small number of ‘hand-picked’ analysts – as James Clapper, the director of National Intelligence, described them – from the CIA, the FBI and the NSA. The claims of the last were made with only ‘moderate’ confidence. The label Intelligence Community Assessment creates a misleading impression of unanimity, given that only three of the 16 US intelligence agencies contributed to the report. And indeed the assessment itself contained this crucial admission: ‘Judgments are not intended to imply that we have proof that shows something to be a fact. Assessments are based on collected information, which is often incomplete or fragmentary, as well as logic, argumentation and precedents.’ Yet the assessment has passed into the media imagination as if it were unassailable fact, allowing journalists to assume what has yet to be proved. In doing so they serve as mouthpieces for the intelligence agencies, or at least for those ‘hand-picked’ analysts. 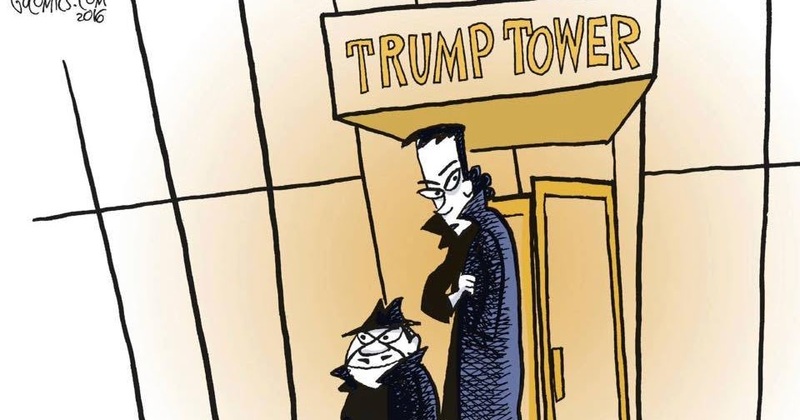 Meanwhile, there has been a blizzard of ancillary accusations, including much broader and vaguer charges of collusion between the Trump campaign and the Kremlin. It remains possible that Robert Mueller, a former FBI director who has been appointed to investigate these allegations, may turn up some compelling evidence of contacts between Trump’s people and various Russians. It would be surprising if an experienced prosecutor empowered to cast a dragnet came up empty-handed, and the arrests have already begun. But what is striking about them is that the charges have nothing to do with Russian interference in the election. There has been much talk about the possibility that the accused may provide damaging evidence against Trump in exchange for lighter sentences, but this is merely speculation. Paul Manafort, at one point Trump’s campaign manager, has pleaded not guilty to charges of failing to register his public relations firm as a foreign agent for the Ukrainian government and concealing his millions of dollars in fees. But all this occurred before the 2016 campaign. George Papadopolous, a foreign policy adviser, has pleaded guilty to the charge of lying to the FBI about his bungling efforts to arrange a meeting between Trump’s people and the Russian government – an opportunity the Trump campaign declined. Mueller’s most recent arrestee, Michael Flynn, the unhinged Islamophobe who was briefly Trump’s national security adviser, has pleaded guilty to charges of lying to the FBI about meeting the Russian ambassador in December – weeks after the election. This is the sort of backchannel diplomacy that routinely occurs during the interim between one administration and the next. It is not a sign of collusion. So far, after months of ‘bombshells’ that turn out to be duds, there is still no actual evidence for the claim that the Kremlin ordered interference in the American election. Meanwhile serious doubts have surfaced about the technical basis for the hacking claims. Independent observers have argued it is more likely that the emails were leaked from inside, not hacked from outside. On this front, the most persuasive case was made by a group called Veteran Intelligence Professionals for Sanity, former employees of the US intelligence agencies who distinguished themselves in 2003 by debunking Colin Powell’s claim that Saddam Hussein possessed weapons of mass destruction, hours after Powell had presented his pseudo-evidence at the UN. (There are members of VIPS who dissent from the VIPS report’s conclusions, but their arguments are in turn contested by the authors of the report.) The VIPS findings received no attention in major media outlets, except Fox News – which from the centre-left perspective is worse than no attention at all. Mainstream media have dismissed the VIPS report as a conspiracy theory (apparently the Russian hacking story does not count as one). The crucial issue here and elsewhere is the exclusion from public discussion of any critical perspectives on the orthodox narrative, even the perspectives of people with professional credentials and a solid track record. Sceptical voices, such as those of the VIPS, have been drowned out by a din of disinformation. Flagrantly false stories, like the Washington Post report that the Russians had hacked into the Vermont electrical grid, are published, then retracted 24 hours later. Sometimes – like the stories about Russian interference in the French and German elections – they are not retracted even after they have been discredited. These stories have been thoroughly debunked by French and German intelligence services but continue to hover, poisoning the atmosphere, confusing debate. The claim that the Russians hacked local and state voting systems in the US was refuted by California and Wisconsin election officials, but their comments generated a mere whisper compared with the uproar created by the original story. The rush to publish without sufficient attention to accuracy has become the new normal in journalism. Retraction or correction is almost beside the point: the false accusation has done its work. The most immediate consequence is that, by finding foreign demons who can be blamed for Trump’s ascendancy, the Democratic leadership have shifted the blame for their defeat away from their own policies without questioning any of their core assumptions. Amid the general recoil from Trump, they can even style themselves dissenters – ‘#the resistance’ was the label Clintonites appropriated within a few days of the election. Mainstream Democrats have begun to use the word ‘progressive’ to apply to a platform that amounts to little more than preserving Obamacare, gesturing towards greater income equality and protecting minorities. This agenda is timid. It has nothing to say about challenging the influence of concentrated capital on policy, reducing the inflated defence budget or withdrawing from overextended foreign commitments; yet without those initiatives, even the mildest egalitarian policies face insuperable obstacles. More genuine insurgencies are in the making, which confront corporate power and connect domestic with foreign policy, but they face an uphill battle against the entrenched money and power of the Democratic leadership – the likes of Chuck Schumer, Nancy Pelosi, the Clintons and the DNC. Russiagate offers Democratic elites a way to promote party unity against Trump-Putin, while the DNC purges Sanders’s supporters. that in exchange for raising money and investing in the DNC, Hillary would control the party’s finances, strategy, and all the money raised. Her campaign had the right of refusal of who would be the party communications director, and it would make final decisions on all the other staff. The DNC also was required to consult with the campaign about all other staffing, budgeting, data, analytics and mailings. Francis Shen of the University of Minnesota and Douglas Kriner of Boston University analysed election results in three key states – Pennsylvania, Wisconsin and Michigan – and found that ‘even controlling in a statistical model for many other alternative explanations, we find that there is a significant and meaningful relationship between a community’s rate of military sacrifice and its support for Trump.’ Clinton’s record of uncritical commitment to military intervention allowed Trump to have it both ways, playing to jingoist resentment while posing as an opponent of protracted and pointless war. Kriner and Shen conclude that Democrats may want to ‘re-examine their foreign policy posture if they hope to erase Trump’s electoral gains among constituencies exhausted and alienated by 15 years of war’. If the insurgent movements within the Democratic Party begin to formulate an intelligent foreign policy critique, a re-examination may finally occur. And the world may come into sharper focus as a place where American power, like American virtue, is limited. For this Democrat, that is an outcome devoutly to be wished. It’s a long shot, but there is something happening out there. As time goes on we get increasing evidence that the DNC rigged the Democratic nomination for Hillary Clinton while the evidence also increasingly casts doubt about her claims that Russia rigged the general election for Trump. 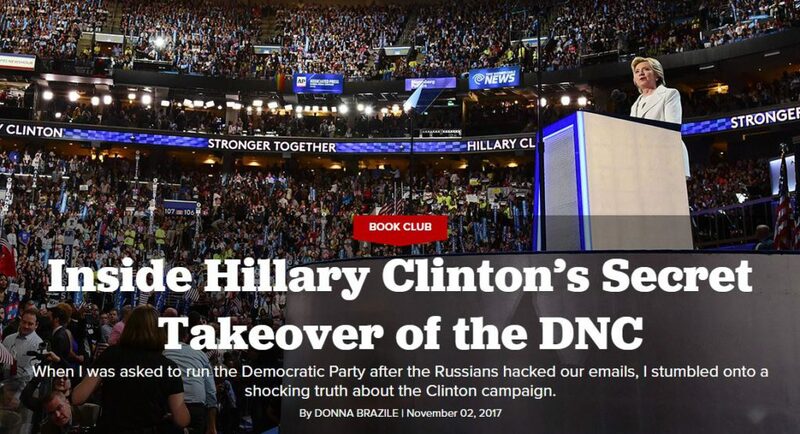 Donna Brazile finally admitted to the unethical conduct at the DNC and rigging the nomination for Hillary Clinton in her new book, Hacks: The Inside Story of the Break-ins and Breakdowns that Put Donald Trump in the White House. I had hoped to have a post up on this earlier but did not have time until now. There was a lively discussion on Facebook after I posted a comment on this earlier today. As I said then, I would have a higher opinion of her if she hadn’t leaked the debate questions to Clinton, and if she wasn’t pushing the bogus line that Russia cost Clinton the election. Yet the states kept less than half of 1 percent of the $82 million they had amassed from the extravagant fund-raisers Hillary’s campaign was holding, just as Gary had described to me when he and I talked in August. When the Politico story described this arrangement as “essentially … money laundering” for the Clinton campaign, Hillary’s people were outraged at being accused of doing something shady. Bernie’s people were angry for their own reasons, saying this was part of a calculated strategy to throw the nomination to Hillary. I wanted to believe Hillary, who made campaign finance reform part of her platform, but I had made this pledge to Bernie and did not want to disappoint him. I kept asking the party lawyers and the DNC staff to show me the agreements that the party had made for sharing the money they raised, but there was a lot of shuffling of feet and looking the other way. When I got back from a vacation in Martha’s Vineyard, I at last found the document that described it all: the Joint Fund-Raising Agreement between the DNC, the Hillary Victory Fund, and Hillary for America. The agreement—signed by Amy Dacey, the former CEO of the DNC, and Robby Mook with a copy to Marc Elias—specified that in exchange for raising money and investing in the DNC, Hillary would control the party’s finances, strategy, and all the money raised. Her campaign had the right of refusal of who would be the party communications director, and it would make final decisions on all the other staff. The DNC also was required to consult with the campaign about all other staffing, budgeting, data, analytics, and mailings. I had been wondering why it was that I couldn’t write a press release without passing it by Brooklyn. Well, here was the answer. When the party chooses the nominee, the custom is that the candidate’s team starts to exercise more control over the party. If the party has an incumbent candidate, as was the case with Clinton in 1996 or Obama in 2012, this kind of arrangement is seamless because the party already is under the control of the president. When you have an open contest without an incumbent and competitive primaries, the party comes under the candidate’s control only after the nominee is certain. When I was manager of Al Gore’s campaign in 2000, we started inserting our people into the DNC in June. This victory fund agreement, however, had been signed in August 2015, just four months after Hillary announced her candidacy and nearly a year before she officially had the nomination. I had tried to search out any other evidence of internal corruption that would show that the DNC was rigging the system to throw the primary to Hillary, but I could not find any in party affairs or among the staff. I had gone department by department, investigating individual conduct for evidence of skewed decisions, and I was happy to see that I had found none. Then I found this agreement. The funding arrangement with HFA and the victory fund agreement was not illegal, but it sure looked unethical. If the fight had been fair, one campaign would not have control of the party before the voters had decided which one they wanted to lead. This was not a criminal act, but as I saw it, it compromised the party’s integrity. Donna Brazile’s confession that the nomination was rigged is hardly the first evidence of this. Their actions were actually quite obvious considering how the rules were used to help Clinton, including both long standing rules to allow the DNC to influence the process, along with changes initiated in 2016 specifically to help Clinton. DNC email released by Wikileaks provided further confirmation. Tom Perez previously admitted this before trying to walk this back. Elizabeth Warren agreed today that the nomination was rigged for Clinton. If the Democratic Party is going to have a chance to restore its integrity and bring back those who are now reluctant or unwilling to vote for a Democrat again, major reforms will be necessary. This includes eliminating Superdelegates, eliminating front loading of primaries in the south, eliminating restrictions on debates, making primaries open, and ideally removing those from DNC leadership positions who were involved in either giving Hillary Clinton the 2016 nomination or the recent purge of progressives. Tulsi Gabbard has also recommended many of these reforms. Update: Donna Brazile Considered Removing Clinton From Ticket And Replacing Her With Joe Biden. Links also in post debunking false claims from Clinton supporters about the excerpt discussed here. …if he runs, he’s got one big roadblock in his way first: The energy in the Democratic Party right now comes from a newly energized left. 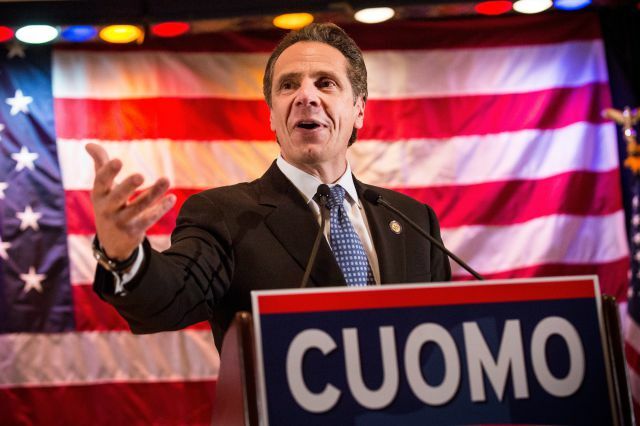 And the energized left, not to put too fine a point on it, hates Cuomo. For the most part, we can dismiss this concept without even addressing the already tiresome idea that what a Democratic voting base that has spent the past six months getting jazzed up about aggressive resistance and unapologetically liberal policies is actually fixin’ to do in 2020 is nominate a moderate centrist triangulating triangulator who—as Politico points out itself!—lowered taxes on millionaires and has close ties to his state’s most powerful corporate executives. Let us simply look, in a nonideological fashion, at two of the most prominent things Andrew Cuomo has done in his time as governor of New York. He announced that he was creating an independent commission—the “Moreland Commission”—to investigate corruption in state politics and then shut it down because it started investigating his own allies. The entire process could not have been more perfectly executed to expose Cuomo as a self-serving hack, and widely respected ex-U.S. Attorney Preet Bharara (a registered New York Democrat) actually used “Moreland Commission” as a shorthand synonym for “craven corruption/ethics fiasco” when he was suddenly fired by Donald Trump in March. Just what Democratic primary voters want—someone who’s known for replicating the worst behaviors of a widely disliked Republican president! He has allowed the New York City subway—which he is ultimately responsible for because the Metropolitan Transit Authority, which runs it, is a state agency—to deteriorate into total disaster. As a New Yorker (humblebrag! ), I cannot overstate how poorly the subway system is currently functioning and how stabby it makes the city’s residents. It looks likely that we will continue to see battles between the Democratic establishment and the left, especially with party rules continuing to favor more conservative nominees. The Oscars had many political jokes at the expense of Donald Trump, but will be most remembered for an epic mistake in announcing the wrong winner for Best Picture. The accounting firm of PricewaterhouseCoopers has taken the blame for handing out a duplicate envelope with Emma Stone’s award for Best Actress, leading to La La Land being announced as the winner instead of Moonlight. Donald Trump has blamed Hollywood’s obsessive focus on politics for the mistake. There were multiple references to diversity and immigrants throughout the awards. He introduced Cheryl Boone Isaacs, President of the Academy of Arts and Sciences, by noting that she is a president who supports both the arts and sciences. Donald Trump’s use of Twitter was also the topic of jokes. Kimmel announced that, “Some of you will get to come up here on this stage tonight and give a speech that the president will tweet about in all caps during his 5 a.m. bowel movement tomorrow, and I think that’s pretty excellent if you ask me.” Later in the show, Kimmel tweeted Donald Trump. Sure La La Land won more than it deserved. Wikileaks has revealed that they had Debbie Wasserman Schultz rig the Oscars. By then the political comparisons were irresistible. I wrote, “Cast of La La Land is now blaming Vladimir Putin and James Comey for them not getting the Oscar.” Then I added that they also blamed Bernie supporters and Jill Stein voters, and that Jill Stein was raising money for a recount. WikiLeaks published documents on Hillary Clinton and the US Democrats. How do you reply to those who accuse you of having helped to elect Mr. Trump? “What is the allegation here exactly? We published what the Democratic National Committee, John Podesta, Hillary Clinton’s campaign manager, and Hillary Clinton herself were saying about their own campaign, which the American people read and were very interested to read, and assessed the elements and characters, and then they made a decision. That decision was based on Hillary Clinton’s own words, her campaign manager’s own words. That’s democracy”. Do you agree with those who say that it was a hit job, because you hit Hillary Clinton when she was most vulnerable, during the final weeks of her campaign? “No, we have been publishing about Hillary Clinton for many years, because of her position as Secretary of State. We have been publishing her cables since 2010 and her emails also. We are domain experts on Clinton and her post 2008 role in government. This is why it is natural for sources who have information on Hillary Clinton to come to us. They know we will understand its significance”. 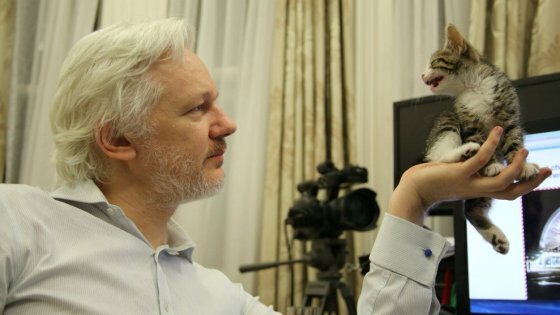 So Clinton is gone, has WikiLeaks won? “We were pleased to see how much of the American public interacted with the material we published. That interaction was on both sides of politics, including those to the left of Hillary Clinton those who supported Bernie Sanders, who were able to see the structure of power within the Democratic National Committee (DNC) and how the Clintons had placed Debbie Wasserman Schultz to head up the DNC and as a result the DNC had tilted the scales of the process against Bernie Sanders”. What about Donald Trump? What is going to happen? “If the question is how I personally feel about the situation, I am mixed: Hillary Clinton and the network around her imprisoned one of our alleged sources for 35 years, Chelsea Manning, tortured her according to the United Nations, in order to implicate me personally. According to our publications Hillary Clinton was the chief proponent and the architect of the war against Libya. It is clear that she pursued this war as a staging effort for her Presidential bid. It wasn’t even a war for an ideological purpose. This war ended up producing the refugee crisis in Europe, changing the political colour of Europe, killing more than 40,000 people within a year in Libya, while the arms from Libya went to Mali and other places, boosting or causing civil wars, including the Syrian catastrophe. If someone and their network behave like that, then there are consequences. Internal and external opponents are generated. Now there is a separate question on what Donald Trump means”. “Hillary Clinton’s election would have been a consolidation of power in the existing ruling class of the United States. Donald Trump is not a DC insider, he is part of the wealthy ruling elite of the United States, and he is gathering around him a spectrum of other rich people and several idiosyncratic personalities. They do not by themselves form an existing structure, so it is a weak structure which is displacing and destabilising the pre-existing central power network within DC. It is a new patronage structure which will evolve rapidly, but at the moment its looseness means there are opportunities for change in the United States: change for the worse and change for the better”. In these ten years of WikiLeaks, you and your organisation have experienced all sorts of attacks. What have you learned from this warfare? “Power is mostly the illusion of power. The Pentagon demanded we destroy our publications. We kept publishing. Clinton denounced us and said we were an attack on the entire “international community”. We kept publishing. I was put in prison and under house arrest. We kept publishing. We went head to head with the NSA getting Edward Snowden out of Hong Kong, we won and got him asylum. Clinton tried to destroy us and was herself destroyed. Elephants, it seems, can be brought down with string. Perhaps there are no elephants”. While there is potential for significant harm under Donald Trump, bringing down such a tremendous force for evil on the world stage such as Hillary Clinton would be a great victory. While the revelations from Wikileaks were damaging to Clinton, it is not clear how much they actually affected the election. They primarily acted to verify criticism already being made of Clinton by Sanders supporters and her opponents on the left. Having Wikileaks as a major news story in October was probably harmful in that this centered much of the discussion in the final days of the election on Clinton’s flaws as opposed to Donald Trump’s flaws. The polls seemed to show signs of limited memory on the part of many voters as Clinton’s lead seemed to grow or diminish based upon which candidate was receiving the most coverage. With Donald Trump staying quieter in the final days of the campaign, it did probably hurt Clinton to have her flaws dominate the news between the Wikileaks revelations, along with further discussion of the FBI investigation of her email. There just isn’t a clean-cut story in the data. For instance, you might have expected a decline in the percentage of Americans who trusted Clinton after Wikileaks began its releases. As Politico’s Ken Vogel pointed out in mid-October, both Trump campaign officials and even progressives said the Wikileaks emails revealed that Clinton would be “compromised” if she became president. But the percentage of Americans who found Clinton to be honest or trustworthy stayed at around 30 percent in polling throughout October and into November. The evidence that Wikileaks had an impact, therefore, is circumstantial. Trump, for instance, won among voters who decided who to vote for in October 51 percent to 37 percent, according to national exit polls. That’s Trump’s best time period. He carried voters who decided in the final week, when you might expect Comey’s letter to have had the largest impact, 45 percent to 42 percent. (Although, Trump’s margin among those who decided in the final week was wider in the exit polls in some crucial swing states.) And while Clinton’s lead was dropping in the FiveThirtyEight polls-only forecast before the Comey letter was released, the drop accelerated slightly afterward. Of course, one thing didn’t sink Clinton. The evidence suggests Wikileaks is among the factors that might have contributed to her loss, but we really can’t say much more than that. “In Russia, there are many vibrant publications, online blogs, and Kremlin critics such as [Alexey] Navalny are part of that spectrum. There are also newspapers like “Novaya Gazeta”, in which different parts of society in Moscow are permitted to critique each other and it is tolerated, generally, because it isn’t a big TV channel that might have a mass popular effect, its audience is educated people in Moscow. So my interpretation is that in Russia there are competitors to WikiLeaks, and no WikiLeaks staff speak Russian, so for a strong culture which has its own language, you have to be seen as a local player. WikiLeaks is a predominantly English-speaking organisation with a website predominantly in English. We have published more than 800,000 documents about or referencing Russia and president Putin, so we do have quite a bit of coverage, but the majority of our publications come from Western sources, though not always. For example, we have published more than 2 million documents from Syria, including Bashar al-Assad personally. Sometimes we make a publication about a country and they will see WikiLeaks as a player within that country, like with Timor East and Kenya. The real determinant is how distant that culture is from English. Chinese culture is quite far away”. Hindsight is easy, but in retrospect there were plenty of clues that Clinton would lose Michigan, and the general election. 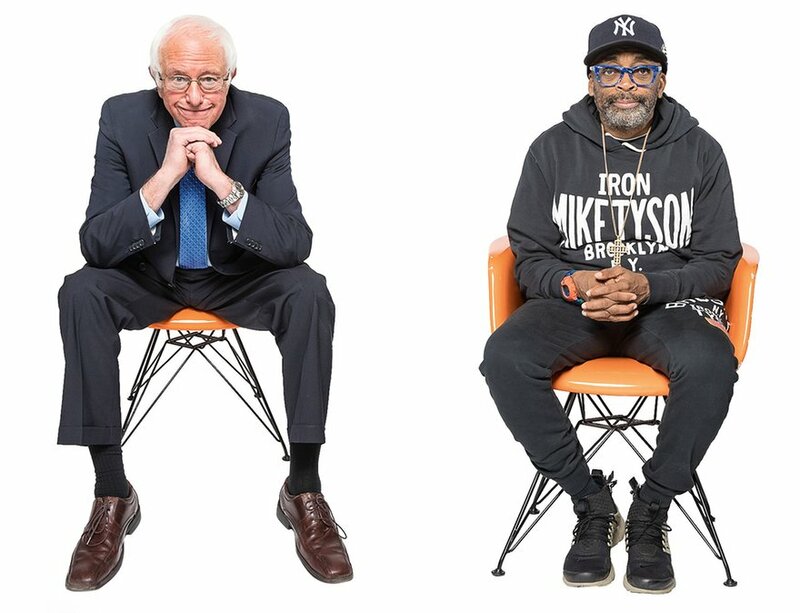 Before the primaries, I noticed an unusual amount of enthusiasm about Bernie Sanders, including from people who are not normally very vocal about politics. Sanders went on to upset Clinton. I saw no signs of enthusiasm for her campaign. I saw a lot of Sanders bumper stickers, a fair number of old Obama bumper stickers, and even a few old Kerry bumper stickers into November. I saw exactly one for Clinton, and that wasn’t until later in November after the election. I know of a street, and I mean one single street, which had a number of pro-Clinton yard signs around where I live. 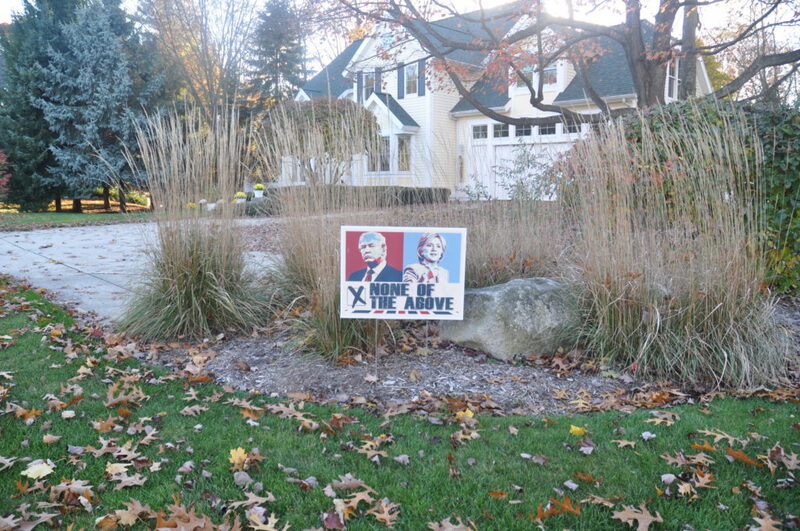 While I had signs up for Kerry and Obama in the past three elections, my yard sign from this election can be seen in the picture above. My antipathy for both major party candidates was shared by others. An unusual number of patients started talking to me about voting for third party candidates (without first hearing of my plans). It was notable to see Clinton rush to Michigan in the final week of the campaign after she earlier had a double digit lead. I questioned her strategy when I saw her ads. Those which I saw solely concentrated on personal attacks (even if valid) against Donald Trump, in contrast to the ads from Trump making promises (regardless of their credibility) of jobs and a brighter future. If someone was already on the fence despite weeks of news about the vile things Trump had said, it was clear which ads had a better chance of sealing the deal. Turn that bus around, the Clinton team ordered SEIU. Those volunteers needed to stay in Iowa to fool Donald Trump into competing there, not drive to Michigan, where the Democrat’s models projected a 5-point win through the morning of Election Day. Michigan organizers were shocked. It was the latest case of Brooklyn ignoring on-the-ground intel and pleas for help in a race that they felt slipping away at the end. Clinton never even stopped by a United Auto Workers union hall in Michigan, though a person involved with the campaign noted bitterly that the UAW flaked on GOTV commitments in the final days, and that AFSCME never even made any, despite months of appeals. Michigan operatives relay stories like one about an older woman in Flint who showed up at a Clinton campaign office, asking for a lawn sign and offering to canvass, being told these were not “scientifically” significant ways of increasing the vote, and leaving, never to return. A crew of building trade workers showed up at another office looking to canvass, but, confused after being told there was no literature to hand out like in most campaigns, also left and never looked back. Most importantly, multiple operatives said, the Clinton campaign dismissed what’s known as in-person “persuasion” — no one was knocking on doors trying to drum up support for the Democratic nominee, which also meant no one was hearing directly from voters aside from voters they’d already assumed were likely Clinton voters, no one tracking how feelings about the race and the candidates were evolving. This left no information to check the polling models against — which might have, for example, showed the campaign that some of the white male union members they had expected to be likely Clinton voters actually veering toward Trump — and no early warning system that the race was turning against them in ways that their daily tracking polls weren’t picking up. People involved in the Michigan campaign still can’t understand why Brooklyn stayed so sure of the numbers in a state that it also had projected Clinton would win in the primary. With Clinton’s team ignoring or rejecting requests, Democratic operatives in Michigan and other battleground states might have turned to the DNC. But they couldn’t; they weren’t allowed to ask for help. While they clearly failed to use the right plan to win in 2016, Clinton supporters are ignoring their mistakes and placing the blame on external factors such as James Comey and Russia. In a race which turned out so close, many factors could have change the result, but it makes far more sense to place the blame both having a flawed candidate and the many mistakes made during the campaign. The same close minded thought processes seen in the campaign could be seen in Hillary Clinton throughout her life, leading Clinton to having been wrong on virtually every major decision of her career. While his appointees and many statements from Donald Trump make me fear a very poor outcome from his presidency, this is still an open matter. Hopefully Bill Gates is right in his optimistic prediction. Clinton’s history of poor judgement, both on campaign strategy and public policy, makes it very doubtful she could have been a competent president. BS Well, you know. We took on the entire establishment and that’s what happens. But we have some enormously difficult times now. We gotta go forward, and I look forward to working with you to make that happen. BS Well, I think a number of people who voted for Obama once, or twice, voted for Trump. And I think the issue is that there are millions of people in this country who voted for Trump but do not accept… I’m not going to deny for a second that there’s a lot of racism and xenophobia and sexism out there; there certainly is. But there are a whole lot of other people who are just really, really hurting. They’re working two or three jobs, they’re worried about their kids, they can’t afford to send them to childcare or to college. And Trump comes along and says, “I’m a champion of the working class.” And he’s a good showman and a good entertainer, and people believed him. But our job now, it seems to me, is in three areas. Number one: to fight him tooth and nail in any movement toward racism, xenophobia, sexism, trying to divide our country up. And number two: if he is at all sincere – and we will see if he is – in developing programmes to create jobs and raise wages, I think we should work with him. But I’ll tell you what also concerns me, not just for this country but the planet, is this guy thinks that climate change is a hoax. Well, let me tell you, it ain’t a hoax. Climate change is real, and if we don’t transform our energy system, the planet we leave for our kids and grandchildren may not be a pretty place. SL Excuse me, if I may, sir; you know I love sports. I’ve seen it too many times, when a team thinks they’ve got it all won, just wrapped up, and you see players go down the sideline and start celebrating, and then they reach the goal line and fumble. The Clintons – and I’m not asking you for a comment; this is my opinion – thought they had it won. And what do the great coaches always say? Keep playing until there is no time on the clock! And it seems to me the Clintons were celebrating before the day was up. SL It was not Hillary Clinton’s birthright to be president of the United States of America! And Trump, he played it like he was going to keep going at this until the whistle blows, until time has run out. BS Right. You’re right. Now, no one can deny that Trump was holding three or four rallies a day, he was running all over this country, working 20 hours a day. And that’s the truth. But I think that speaks to, Spike, something that goes beyond Hillary Clinton. It really goes to the very nature of the Democratic party. SL Would you say that it’s a shambles, now, Senator – the DNC? SL There’s a whole lot of finger-pointing going on. BS Yes. I think we need a house-cleaning. I think the DNC needs an entirely new direction. I think it needs leadership, and I think it needs to be very clear about the fact that it stands with working families and is prepared to take on the billionaire class and Wall Street, and corporate America, and the drug companies and the insurance companies. People are hurting. And we need a programme that stands with working families and brings people together. SL Were you ever offered the VP position, sir? SL Would you have taken it? BS Er. Probably, yes. But that’s again looking through the rear-view mirror. SL [Long silence.] Hmmm. This is a rhetorical question, but I just want readers to understand this, very clearly. Where do we go? Where is the hope? BS OK, here is where the hope is. The hope is to understand that the Democratic party has stumbled very significantly in the last number of decades. It’s not just this election, Spike, as disastrous as it has been. It is the fact that the Republican party controls the Senate, controls the US House, controls something like two-thirds of the governor seats in this country, and that the Democrats have lost over 900 state legislature seats in the last eight years. What that tells me is that the Democratic party has got to very fundamentally rethink who it is and where it goes. It has to shed the current situation where it’s a party of the liberal elite, a party of wealthy people who give substantial sums – we can use that money, that’s fine, but it must reidentify itself as a party of working people. Whether you’re black, white, Latino, there are millions of people today who are working longer hours for lower wages, and they’re seeing almost all new income and wealth going to the top 1%. The Democratic party has got to say we are on the side of the 99%. Our party is not about having fancy fundraisers, it’s about going into union halls, veterans’ halls, farm communities, the inner cities. It has to bring people together around the progressive agenda and make government work for all of us and not the 1%. That’s why I’m supporting Keith Ellison [as prospective chair of the DNC]. SL Oh, yes. He’s the Muslim brother, right? BS Yes. He’s a very good guy, and he’s the co-chair of the house progressive caucus. Very progressive guy. And I think Keith understands that the future of the Democratic party is a grassroots party. So I’m going to be supporting him and shaking up the Democratic party. SL Let me ask you another question. The coalition that Obama got, that put him in office – did the Clinton campaign think it would automatically win [those people] without having to work? I don’t understand it. Because I did not feel the energy there was for Obama – even for you – for Hillary Clinton. I respect the woman, but the enthusiasm wasn’t there. BS I think nobody would argue with you on that. What we have seen is that in 2008 Obama ran a historical campaign where the turnout was extraordinarily high: enthusiasm in the minority community, strong support in the white working class, and that carried over in 2012. But in 2016, what we saw – I think your point is quite right – it would be hard to suggest that the people of this country were enthusiastic about the Clinton campaign. There was not the energy we have seen in the Obama campaign, and what ended up happening was voter turnout was low. She won the black community overwhelmingly, but turnout was low. She lost a lot of white, working-class people. That’s just the fact. The Democrats have lost badly in 2010, 2014, and now in 2016 when they ran as Republican-lite. They will need to rebuild at the grassroots, and they will need to stand for something. If Clinton could not physically continue her candidacy, she would have to voluntarily cede her nomination, creating a vacancy at the top of the national ticket. 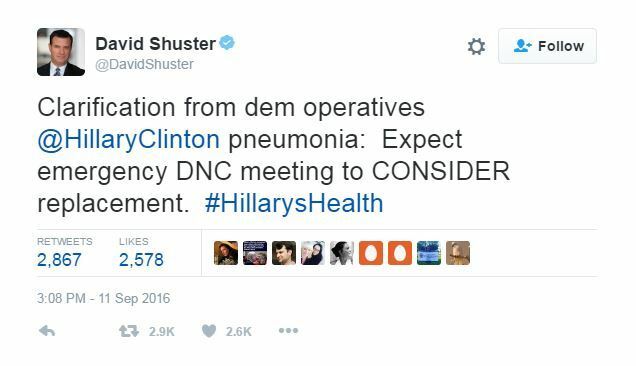 If she did, party procedures give the chair of the DNC authority to call a “special meeting” to vote on a replacement nominee. In this case, because chairwoman Debbie Wasserman Schultz resigned in July, her successor, Brazile, has that authority. Fowler argued that the party would be wise to immediately set up an even more detailed process for those who might seek to be Clinton’s successor — from a signature-gathering requirement to a process for receiving nominations during the DNC meeting. All of which, he said, would help ensure confidence in the process and lead toward a broad coalescing around a successor candidate. There is more on the topic here, here, here, and here. The key facts are that Clinton would have to agree to give up the nomination. The Democratic National Committee would then chose her replacement. The later it occurs, the more chaotic matters would be because of missing deadlines to change the candidate in various states. This may or may not matter in different states as it is possible that in many states Clinton’s name would still remain on the ballot, but electors would then vote for the new Democratic nominee in the electoral college. The DNC could conceivably choose Bernie Sanders as the second place candidate after the primaries, but I have my doubts that the Democratic establishment would do that. After all, if not for the Democratic establishment tilting the race towards Clinton in the first place, it is very likely that Sanders would have won the nomination. Joe Biden is the most likely replacement due to his name recognition and popularity. Other plausible choices include John Kerry and Elizabeth Warren. If Clinton were to leave the race, the timing could also make a huge difference in what occurs. At this point I doubt Tim Kaine would be the choice as so far the vice presidential candidates have not had that much exposure. However, if Clinton should leave the race after the Vice Presidential debates, and should Kaine have an outstanding performance, he might also be considered. The timing could also have a tremendous impact on the election results. Under normal circumstances a party losing its nominee would be placed at a disadvantage. In this case, running against a Republican candidate as awful as Donald Trump, a late entry could still have an excellent chance. A different candidate might actually do better than Clinton considering how unpopular she is. The timing could also be important here. A different candidate would have a better chance if entering the race soon, when there is still time to campaign. Whether it occurs after the debates could also be crucial. Should Trump manage to appear credible in a debate against Clinton, it would be harder for someone entering the race late to compete. Again, this is all pure speculation. It is unlikely that Clinton will leave the race, but the unprecedented situation of a late change in candidates does make for an interesting story. If that isn’t a veiled threat to attack Russia in retaliation for their alleged “cyber-attacks” on the Democratic National Committee and the Clinton Foundation, then what is she trying to say? This should scare the bejesus out of “liberals” and others on the left who have been scammed into jumping on the Clinton bandwagon in the name of stopping Trump. Are we really going to start World War III in order to avenge the honor of Debbie Wasserman Schultz? Given how problematic attribution is in the case of cyber-attacks, this threat of “military action” makes Dr. Strangelove look sane. For all the yelping and screeching in the media about how Trump is “unstable,” and even crazy, this threat shows that Hillary in quite simply unhinged. Her major theme these days resembles something out of Joe McCarthy’s playbook: her campaign has come right out and said Trump is “Putin’s puppet.” And since she so clearly believes the Russians are actively disrupting her efforts to take the White House, it’s reasonable to assume her policy toward Russia will reflect this in a vindictive campaign of revenge. And they tell us Trump is “scary”! If Hillary Clinton doesn’t scare you, then you aren’t paying attention. It is no surprise that the arms industry has been donating so much money to Hillary Clinton. There is a long history of bad blood between Clinton and Putin, and neocons have long desired to try regime change in Russia. We saw how well that worked out in Iraq. Donald Trump’s naive man-crush on Putin in response to a compliment from Putin is also disturbing, but Clinton’s long history of belligerence towards Russia really should scare us. The facts behind the DNC hack remain unclear, with the anti-Russia hysteria raised by the Clinton camp sounding remarkably like the both Cold War red-baiting and like the anti-Iraq hysteria during the run-up to that war (with Hillary Clinton falsely claiming that their were ties between Saddam and al Qaeda). While I would not exclude the possibility of Russian involvement, Putin has again denied responsibility. Sen. Hillary Rodham Clinton drew another distinction between herself and Sen. Barack Obama yesterday, refusing to rule out the use of nuclear weapons against Osama bin Laden or other terrorists in Afghanistan and Pakistan. “Presidents since the Cold War have used nuclear deterrents to keep the peace, and I don’t believe any president should make blanket statements with the regard to use or nonuse,” Clinton said. U.S. officials rarely rule out nuclear attacks as a matter of diplomacy, preferring to keep the threat as a deterrent. Yet several foreign policy experts said Obama was essentially right: It would be unwise to target an individual or a small group with nuclear weapons that could kill civilians and worsen the United States’ image around the world. This year Donald Trump has been criticized for not taking nuclear weapons off the table in fighting ISIS. While he was wrong, his position was essentially the same as the position promoted by Hillary Clinton.